By following these steps carefully and thoughtfully, the result will be a durable, effective and stylish shade in your outdoor area – in the garden, on the patio or on the children’s playground. When planning to install our shade sail, some significant factors should be taken into consideration (for example, the movement of the sun, design of the sail and its characteristics). Planning is the most important part of the process as it ensures that the shade sail will fulfill the task in all its glory. 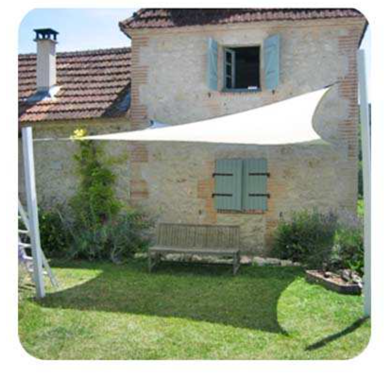 In your mind, you probably already have a place chosen where to install our durable high quality shade sail. But still the question remains – how? We will help you starting with step one and guarantee a perfect result! Sun rises in the east and sets in the west. Depending on the season, sun is either moving lower (cold months) or higher (during summer). The positioning of the shade sail should be planned in a way to offer most protection in the summer period when it is needed the most. As seen in the figure above, the stretched sail is smaller than the area between the anchoring posts. For the sail to be stretched out enough, sufficient space should be left between the sail and the anchor points – this allows the adjusting of turnbuckles. We recommend that the attachment points are positioned further away and surrounding a larger area than the one you want to be in the shade. Generally, the space between the sail and the anchor points should be around 300 mm, depending on the size of the sail. Already existing constructions (walls of a house, a pergola) can be used as anchoring points. Alternatively, steel posts could be placed, creating a completely custom solution. Of course, these two solutions can be merged by using an existing construction as well as placed posts to attach the shade sail. If the sail is attached to an existing construction, it requires some careful thought beforehand in terms of safety. The weight generated on anchor points due to strong winds is not to be underestimated. When installing, at least 30+ kg of stress for each corner of the sail (50+ kg for larger sails) should be accounted for. Specific recommendations are listed on our website next to each product. To make sure the existing construction is strong enough, we recommend a consultation with a qualified engineer or a construction worker. To ensure the effectiveness of the shade, we recommend using metal posts. Metal is strong and doesn’t deflect, it’s also weather proof. To prevent corrosion, posts should be coated with an appropriate emulsion or alternatively, steel or aluminum posts coated with zinc should be used. Steel posts are stronger and also cheaper. And why not use a corroded metal and cover it with transparent lacquer – you will achieve a stylish result! Before installing the posts, make sure that there are no underground utilities (water or sewage pipes, electrical or communication cables). Damaging these utilities can be very dangerous and repairing them is costly. We present the shade sails of Sail Shade World as the highest quality sails in the world and for that reason we expect a thorough preparation from our clients regarding the measurements as the correct installment of the shade sail will ensure its highest possible functioning and durability. You can order the most suitable shade sail from our website: www.shadest.com. 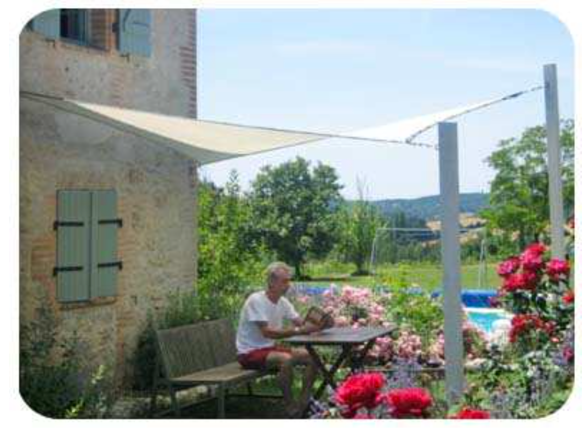 From our website you can also find all the relevant information regarding shade sails. Additional questions can be forwarded to us by e-mail info@shadest.com or calling us by phone +372 5379 6829. Once the first steps have been thought out and the plan is ready, you can now start with the first stage of the installation, installing the anchor points. 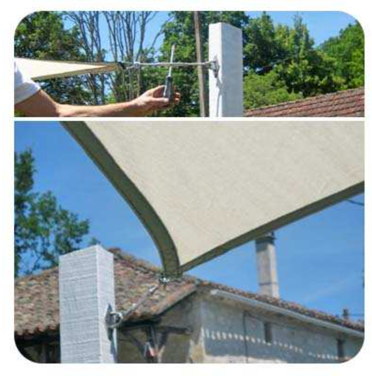 When our shade sail is delivered to you, installation can begin! As mentioned before, when installing the anchor points, never underestimate the importance of the quality of the building’s foundation and existing constructions (such as a wall of the house) – the usage period of a sail that is installed properly and safely is many years which makes it an affordable solution. The more careful and foreseeing you are in this beginning stage, the longer lasting construction of the sail you’ll achieve. 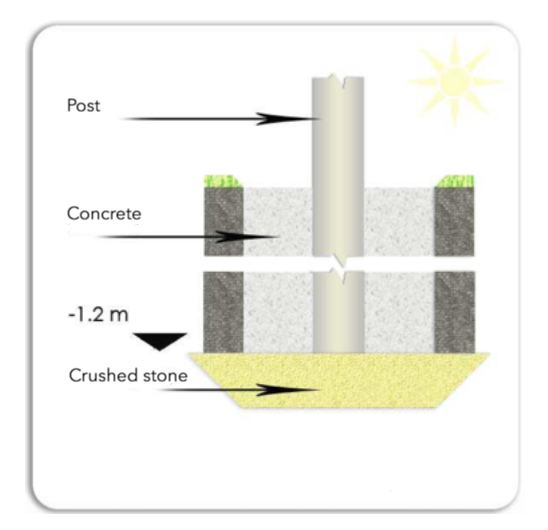 The footing of the post depends on the post size and height above ground. Old and reliable construction rule teaches that “1/3 in the ground, 2/3 on the ground”, that means, the footing of a 2400 mm post should be 1200 mm underground. Even a little movement of the foundation will reduce the tension of the sail which will reduce the length of life of the sail. The opening for the footing should be ca Ø350mm, depending on the dimensions of the post. 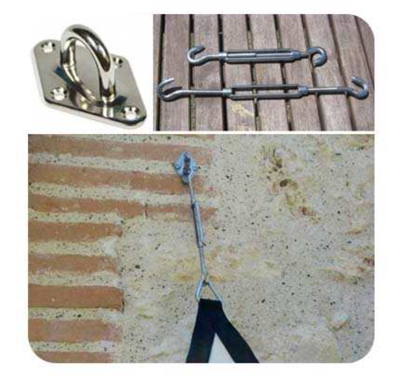 Each corner of the sail needs a recommended combination of a steel pad eye, turnbuckle and carabiner. For example: to install a rectangle shade sail, we recommend using 4 pad eyes, 2 turnbuckles and 2 carabiners. Of course, while choosing the attachment fixtures, it’s necessary to consider the solution suitable for you. When anchor points are fixed, installing the shade sail is quick and simple! 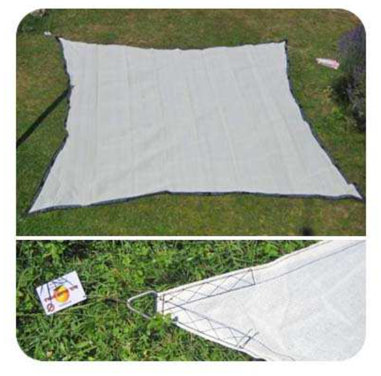 The package delivered from us contains the shade sail and the ordered attachment fixtures. Spread the sail open to ensure its suitability for placing it in the planned location. Connect the attachment eyelets in the corners of the shade sail with the previously installed anchor points (post, wall of a building). For installing this sail, turnbuckles and pad eyes are used. Turn the turnbuckle loose to its maximum length. Attach one hook of the turnbuckle to the pad eye fixed on the wall and the other hook to the eyelet in the sail. Do the same with the attachment points in the diagonal direction. Attach the third end of the sail and after that the fourth, which is the last one. Turn the turnbuckles loose to their maximum length and use the hooks at the ends of the turnbuckle to attach the sail to the pad eye on the post or on the wall of the house. After that, attach the rest of the corners with a carabiner to a pad eye. We recommend attaching the anchor points so that two diagonally paired corners are positioned lower and the other two higher, to create a more visual design. 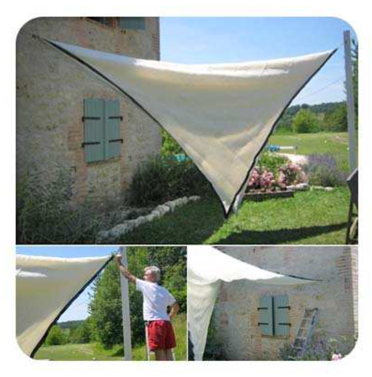 Then “raise the sails” or add tension to the fabric equally from each corner: this will ensure the beauty of the shade sail and its durability. Double check every anchor point and turn the turnbuckles as tightly closed as possible! As mentioned before, the quality of the sail and its length of life depend heavily on the correct installation. The fabric, side stitches and attachment eyelets are designed to withstand great force so don’t be afraid to add maximum tension to your sail! ENJOY A COOL SHADE AND UV PROTECTION!